What's Beyond Forks? : Let's Talk: If You Could Spend a Day With One Book Character, Who Would It Be, and Why? Let's Talk: If You Could Spend a Day With One Book Character, Who Would It Be, and Why? Let's Talk is a fun new weekly meme, hosted by i swim for oceans, in which we discuss anything and everything about books! If you could spend a day with one book character, who would it be, and why? This is a hard one to answer. There are so many characters that I'd love to hang out with. I guess it would depend on if I wanted to use this visit to learn from them or to have fun. Right now, I'm in a goof ball mood so, we'll go with the "have fun" option. 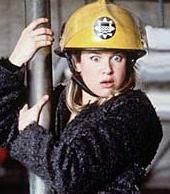 I would have to say Bridget Jones would be super fun to hang out with for a day. There's no telling what shenanigans we'd get into, but I just know we'd have a great time in the process. What about you? If You Could Spend a Day With One Book Character, Who Would It Be, and Why? I would probably choose Gray Pierce from the James Rollins' Sigma series. I always imagined him very good looking with an intelligence that is scary. But I would love to talk to him about what he has seen in the books. Weird, I know but I love reading about those things, which are mostly true (to some extent, right? ).